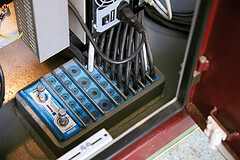 Roxtec is ideal attachment for Atex enclosures from Delvalle. The Roxtec sealing system has been tested and approved for use in constructions onshore and offshore, to protect people and investments. Certified protection the Roxtec sealing system has been tested and approved for use in constructions onshore and offshore, to protect people and investments. Roxtec cable and pipe transits ensure operational reliability by protecting from hazards induced by water pressure, fire, jet-fire and gas, and by minimizing the risk for explosions. In addition, special EMC versions can be used to prevent electromagnetic disturbances from interfering with equipment. Since certification is constantly updated, please contact us for further information. Certified for use in IP rated equipment. Roxtec Ex Cable entries are intended for use in potentially Explosive Atmospheres, according to the European, ATEX Directive 94/9/EC. Our ATEX-certified products are marked “II 2 GD Ex e IIC Gb and II2D Ex tb IIIC Db” and are intended to be installed in zone 1 and 2 in risk areas for gas, mist or vapours. In risk areas for dust, the products are allowed to be installed in zone 21 and 22. The cable entries are to be used only in combination with specified Ex modules.